Poires Belle-Hélène: To poach or not to poach? In the last few months before I started my master's degree, I worked as a crêpe-maker. Beyond the wages, this job was beneficial for me in two respects. For one, my spoken French improved enormously (if you want to get better at a language, having people yell at you in it is a pretty effective way). I also learned that, in spite of my interest in cooking in home kitchens, I never, ever want to work in a restaurant again. In this busy kitchen, we churned out crêpes in all seasons (the leadup to Valentine's Day was particularly brutal), and I still remember the recipes: a Provencale crêpe had egg, tuna, mozzarella, and a scoop of red pepper pesto, while a Savoyarde crêpe had an 80-gram bag of Raclette cheese, ham, and tiny boiled potatoes which came ready to serve in big cans from Belgium. One dessert crêpe we served was the Poire Belle-Hélène, which was topped with sliced canned pears, vanilla ice cream, and dark chocolate sauce. I was surprised to learn from Carolynn's blog post that the pear, chocolate, and vanilla combination was one of the many culinary developments of Auguste Escoffier. I wondered how the name "Belle-Hélène" came to be. After all, Escoffier had introduced the world to Pêches Melba, another poached-fruit dessert, which was named after Australian soprano Nellie Melba. Knowing this, I wondered if Escoffier knew a certain someone in his youth, a particularly attractive Hélène, who had lent her name to the dessert. I couldn't help but imagine Escoffier sitting alone in his restaurant after all the patrons had gone home, eating leftover pears in chocolate sauce and thinking about his unrequited love. It turns out, however, that the combination was named for the Jacques Offenbach satirical operetta La Belle-Hélène, which premiered in Paris in 1864. The dish was named to promote the operetta, which told the story of Helen of Troy and skewered the opulence of Napoleon III's reign. If a real-life Hélène helped to inspire Escoffier to make this dessert, she has been lost to history. Escoffier's wife's name was Delphine, a name which I couldn't find anywhere in Le guide culinaire. While the name sounds fancy, Poires Belle-Hélène are quite simple to make. Furthermore, you can make or buy all the components ahead of time, assembling the dessert just before serving. This makes them ideal for a restaurant dessert (as long as your servers get to the kitchen before the ice cream melts), as Escoffier likely realized. Thinking of my own restaurant days made me wonder if the substitution of canned pears was a fitting one. I decided to try the dessert two ways: one version where I poached the pears in vanilla syrup and a second version using canned pears. 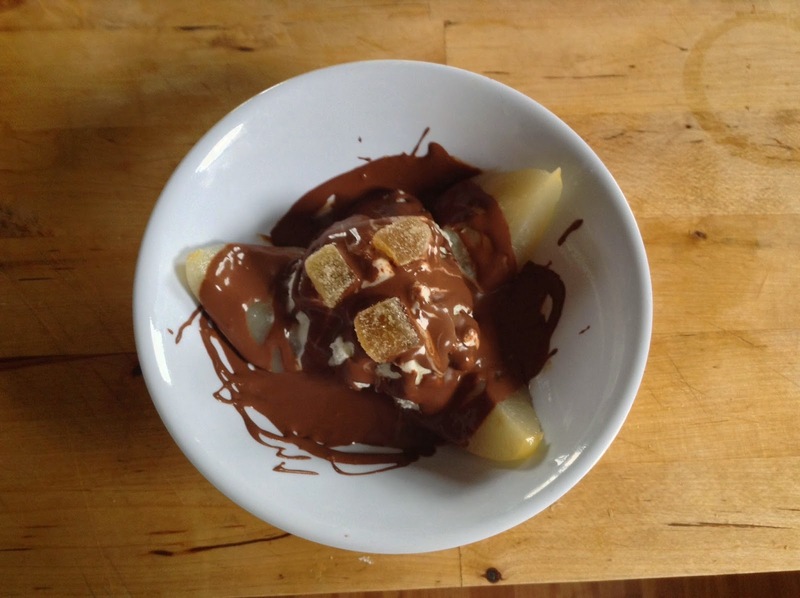 I wanted to know if, once the pears were covered in chocolate and ice cream, their freshness really mattered. I had three pears in my crisper drawer, organic Bartlett pears from Argentina which had been waiting patiently to be turned into smoothies. 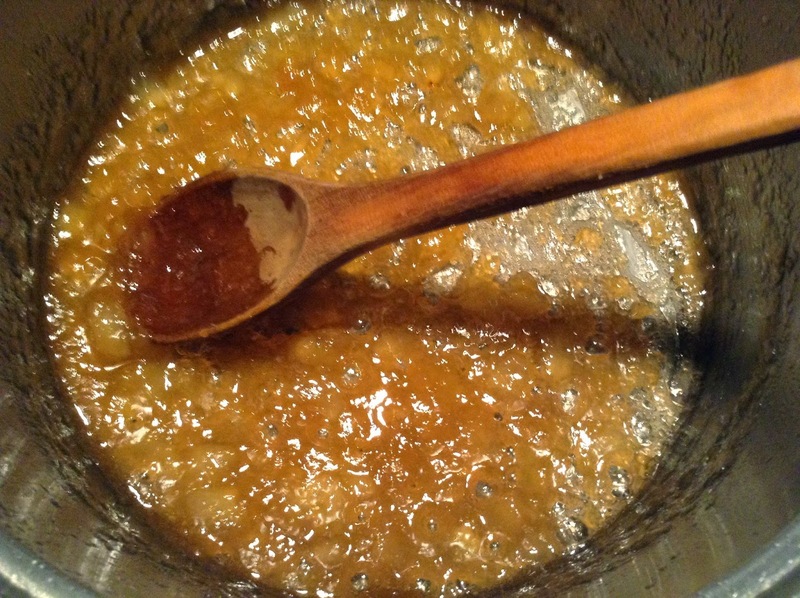 I peeled and quartered them and got to work on a light sugar syrup: 1 1/3 cups of sugar dissolved in a quart of water. Once the syrup was bubbling, I popped the pears in. This would have been the ideal place to slip in a split vanilla bean, but, being a historical cook on a budget, I ended up splashing a couple teaspoons of vanilla extract into the syrup after the pears were done cooking. I also opened a can of the only preserved pears available at my supermarket, also Bartletts, although these were grown in the United States and preserved, halved, in syrup. I made a chocolate sauce according to Escoffier's directions, but was baffled by the fact that I was supposed to melt the chocolate in water, adding three tablespoons of cream and a "walnut of best butter" at the end of the cooking process. As I'd predicted, the sauce tasted a bit watery, so I ended up adding more cream, finally ending up with a thick, heavy chocolate sauce. 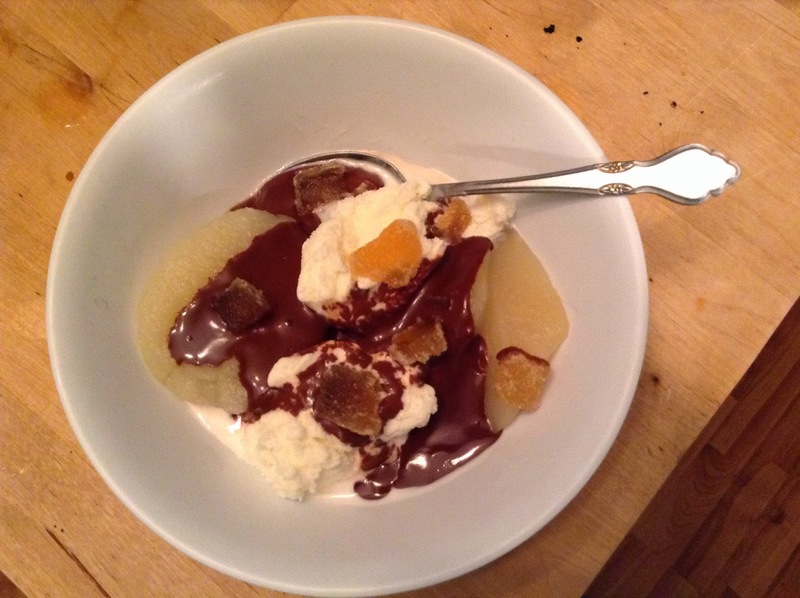 I had store-bought vanilla ice cream, which melted immediately when placed next to the warm poached pear and very warm chocolate sauce. I didn't have the crystallized violets the recipe called for, either, but thought that a few slices of candied ginger would go well with the pear. Tasting the two pears side by side surprised me: even though my fresh pears hadn't been the greatest quality, they tasted much better than the canned pears, which were flavorless by comparison. Depending on your location and income level, it's not always easy to find good-quality fresh fruit. However, the poaching process added so much flavor to my fresh pears that I'd highly recommend it. 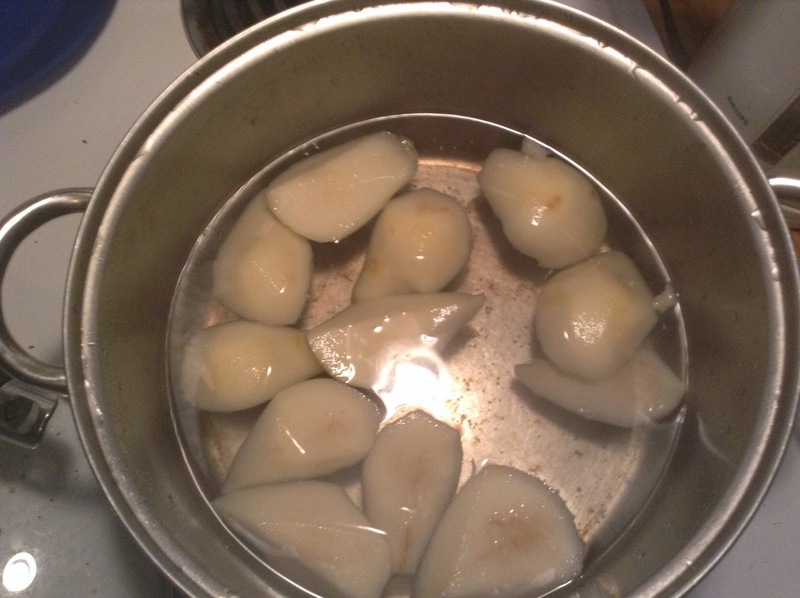 Poaching the pears yourself also means that there's a chance to customize their flavour; instead of vanilla, some wine, ginger, or berries would make a great addition to the poaching liquid. The leftover syrup could be drizzled over pancakes, added to batter for bread pudding, or - in my case - used to make a quick jam out of the flavourless canned pears and the rest of my candied ginger, following Catherine Parr Traill's method. As for my chocolate sauce, maybe it would have been better for me to follow Escoffier's recipe more closely; when I pulled it out of the fridge the day after I made it, I found myself with a rich chocolate pudding rather than a pourable chocolate sauce. Oops. I suppose that's the result of all the extra cream I added. Whether you can make Escoffier's mother sauces in your sleep or you're just starting out in the kitchen, Poires Belle-Hélène is an easy dessert to make. Even better, the recipe is adaptable to just about any budget. You could poach another fruit such as peaches or plums, depending on what's in season; make your own ice cream or buy whatever's on sale at the grocery store; make a chocolate sauce yourself or use a jarred version. If you decide to make this dessert -- whether in honour of a beautiful person named Hélène or because you're really passionate about mid-19th century opera -- I recommend taking the time to cook and flavour the fruit yourself. I found it made all the difference.